You are here: Home / Blog / Mathematics / Place Values for my six year old. My son is fun and at six years old finds the most odd items interesting. Case in point is numbers. Ever since he was little he would tell me he loved me 1 times and I will tell him well I love you ten times. Then he would retort then I love you one hundred times and we would go back and forth each week we would learn and add a new place value to our fun equation. Tiberius did not know he was learning. He just thought it was fun to count higher and higher. Then when we were in public he would enjoy telling people that the largest number he knew was 999 octillion. He really enjoyed the reactions when people did not even know octillion was a number. Well it has been over six months since he has asked to learn a new one and well yesterday was a big one. He wanted to know the next one and I told it is was nonillion and he asked what the next after that was, I said decillion. Then he ask for more, I told him I would have to look it up. Going to wikipedia I got an ok sized chart of the base-illions. He goes ahead and looks it up and finds centillion 1 with 303 zeros after it. Now he wants to skip to that one. Then he sees millinillion which is 1 with 3003 zeros after it. So I go to facebook and ask the masses for help. Should I let my son skip around and not learn the numbers but instead just the cool names of the big ones. I know he wants to show off how he knows big numbers but I think he should know the ones in between as well. So far it seems most parents agree with me and most non-parents suggest he skip around and do whatever he wants. Then this morning comes around and he asks for a proper chart like the ones on google. So a quick search and I see a simple chart to Millions. But he had been searching for a while and could not find anything with octillion or even trillions. I told him after he was done with his daily reading and math lesson that we would make a proper one. So to that end this is a free chart for any math lovers out there. You can put your number in starting at the ones place and moving left fill in the rest of your number. Then you can easily be able to read the long form of your number by using the chart. If you want the PDF just email joeboy@yctp.com and I will happy to give you one. https://yourcomputersolutions.net/wp-content/uploads/2017/06/place-values.png 299 788 Joe Boy https://yourcomputersolutions.net/wp-content/uploads/2015/01/logo-test4-300x138.png Joe Boy2017-06-07 00:38:552018-05-20 16:10:57Place Values for my six year old. I home school my son and I wanted to find a place value chart that went beyond the normal “thousands/millions” charts that are usually circulated for free online. 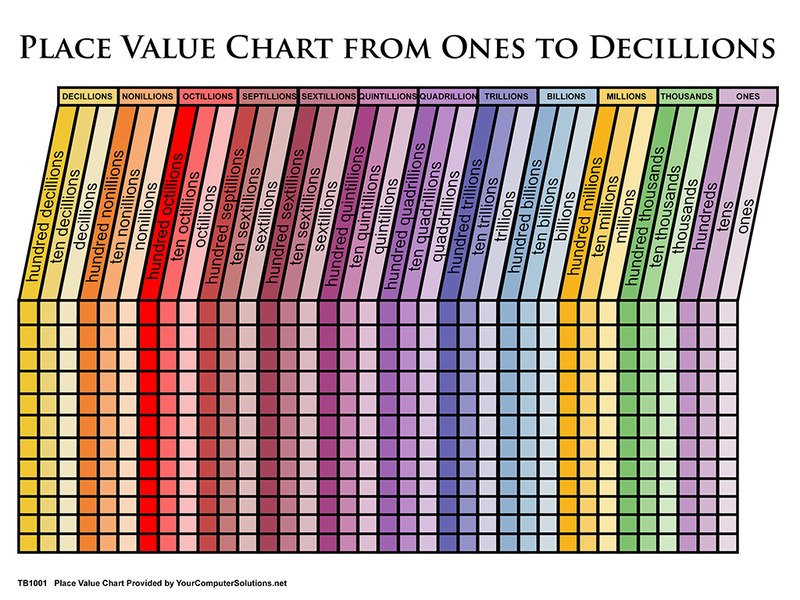 After doing a Google image search I stumbled upon this chart and it is beautiful! Thank you for the pdf version. I am printing it out now as I type and I am going to laminate it. Knowledge is everything.